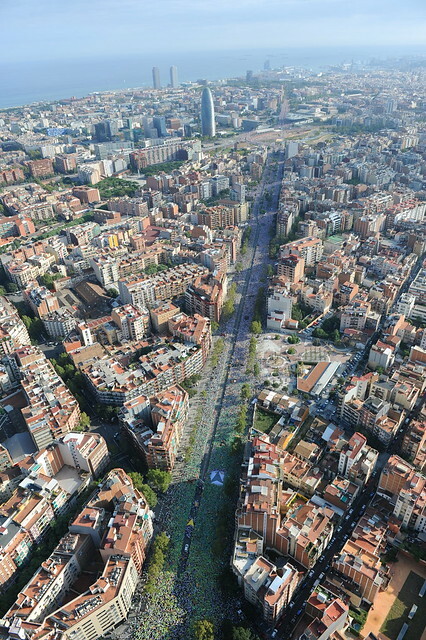 The freeway to the Catalan Republic gathered over a million people forming a giant human mosaic over 5.5 km long, right in the middle of the political campaign of the 2015 Catalan election. Yet again, a massive, quiet and peaceful rally stretched from the northern edge of the city of Barcelona to the gates of the Catalan Parliament along the Meridiana avenue. Pro independence coalitions and parties won a landslide majority in the elections held on September 27th and agreed on a roadmap to a binding independence referendum, due in September 2017.